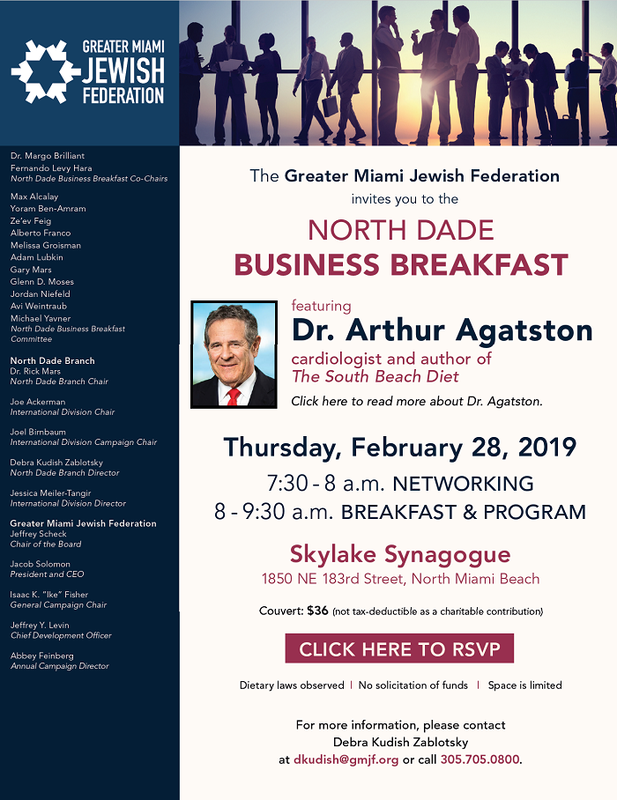 Please join us for a North Dade Business Network Breakfast on February 28, 2019 at Skylake Synagogue. We will have time to network with other professionals as well as hear from Dr. Arthur Agatston, world renowned cardiologist and author of The South Beach Diet. Arthur Agatston MD, FACC is a world renowned cardiologist who is best known for his contribution to medicine by his development of the “Agatston Score.” Dr. A is also an expert in nutrition who authored the New York Times #1 best seller “South Beach Diet” in followed by 12 other nutrition, cardiac prevention and gluten related books which have sold more than 23 million copies in 33 languages worldwide. He has authored more than 200 scientific papers and abstracts. He was recognized as one of “Time 100” most influential individuals in 2004.